Hi Friends! One of the many things I love about the Christmas season is baking holiday cookie recipes for parties and cookie exchanges with my family and friends! But in this busy season, sometimes it’s hard to find the time to make something from scratch for those last-minute parties (or if you’re like me, those parties you totally spaced because you’re so crazy busy). That’s where these frosted chocolate peppermint cookies and Nestle Toll House come to the rescue! Nestle Toll House has a great selection of cookie dough and morsels to help you make the most of your baking this holiday season! To make these frosted chocolate peppermint cookies, I used Nestle Toll House Refrigerated Dark Chocolate Peppermint Cookie Dough. It’s a fudgy dark chocolate cookie dough made with cocoa and filled with peppermint chunks and Semi-Sweet Morsels. (This seasonal product is only available during the winter months.) Paired with a super-easy vanilla frosting recipe and a chopped candy cane topper for an extra holiday kick, these cookies are sure to be a party crowd pleaser! Holiday baking has been an important part of our family traditions for many generations. Baked gifts for family and friends always had special meaning, because it was a handmade labor of love! And when the loved one receiving the baked gifts shares them with their family and friends, they spread the love and holiday cheer! Make sure to follow Nestle Toll House on Pinterest and Facebook to get updates about all the awesome Nestle Toll House products! Follow Nestle Toll House on Facebook! Follow Nestle Toll House on Pinterest! 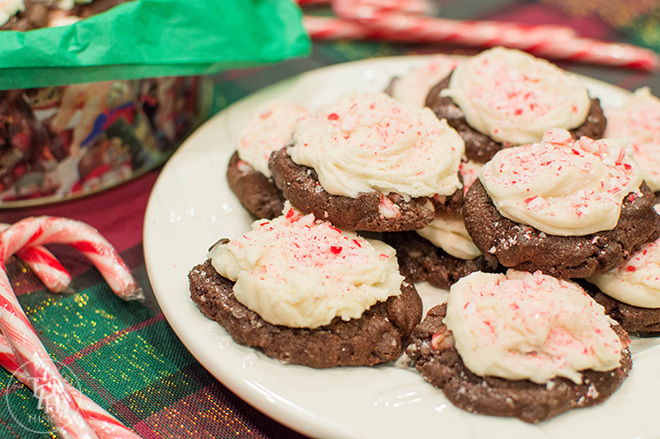 Now let’s make these awesome frosted chocolate peppermint cookies! Bake Nestle Toll House Refrigerated Dark Chocolate Peppermint Cookie Dough according to the package directions. I also included these directions in the recipe below. Whip up the super-easy to make frosting from the recipe below and chop up 3 candy canes for the topping. Preheat oven to 350 degrees. Break dough along pre-scored lines. Place 12 cookies 2″ apart on ungreased baking sheet(s). Bake 10 1/2 minutes to 11 /1/2 minutes. Allow cookies to cool for 2 minutes on the cookie sheet, remove and allow to cool completely before frosting. Beat butter until fluffy. Mix in powdered sugar gradually one cup at a time. Mix in the cream and vanilla and beat until smooth and fluffy. Frost the cookies. Chop 3 candy canes and sprinkle on top of frosted cookies. I’d love to hear about your favorite baking traditions for the holiday season! Please tell me all about them in the comments section below! Thank you Nestle Toll House for giving me the opportunity to try your wonderful baking products! Yum! These sound amazing. Thanks for sharing at My Flagstaff Home! You’re welcome Jennifer! 🙂 Thank you for hosting! I couldn’t agree more! 🙂 Thank you! They sound yummy, thank you for sharing! Thank you for linking up! Your post has been pinned to the party’s Pinterest board (https://www.pinterest.com/pinteresab/holidays-celebration-2015/). Feel free to link up other posts too, and stay tuned for the features on Friday! I’m so hungry looking at these cookies. 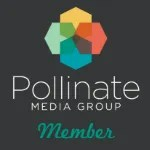 Thank you for sharing on small victories. You’re welcome! 🙂 Thank you for hosting the link party!